In an earlier tutorial we were able to measure horizontal surfaces such as floor, tables, etc. with ARKit. 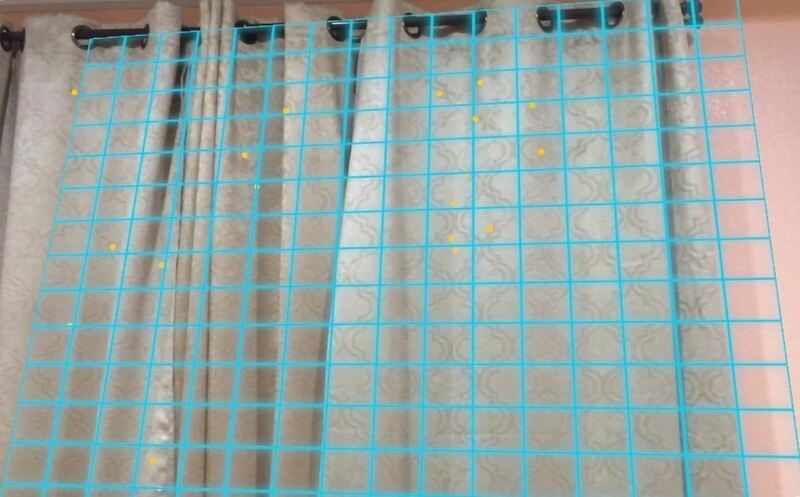 With ARKit 1.5 we can now measure vertical surfaces like walls! Learn how to use ARKit to create your augmented reality app for iPads and iPhones. In particular, we will talk about how we can see vertical planes and their dimensions. We will learn to recognize vertical planes and to precisely determine their sizes with ARKit 1.5. A mobile device running iOS 11+ on an A9 processor or later. Basically, the iPhone 6 S and above, the iPad Pro (9.7 inches, 10.5 inches or 12.9 inches, first generation and second generation) and the iPad 2017 or later  Fast 4.0. Although Swift 3.2 works on Xcode 9.4, I strongly recommend that you download the latest Xcode to stay up to date. If not sure how to do it, follow Step 2 in our post about controlling a 3D layer using hitTest to get your AR project in Xcode set up. Give your project a different name. B. NextReality_Tutorial7 . Be sure to do a quick test before continuing with the following tutorial. In the Project Navigator, click the Assets.xcassets folder. We will add our 2D images here. Then right-click on the left area of ​​the area on the right side of the project navigator. 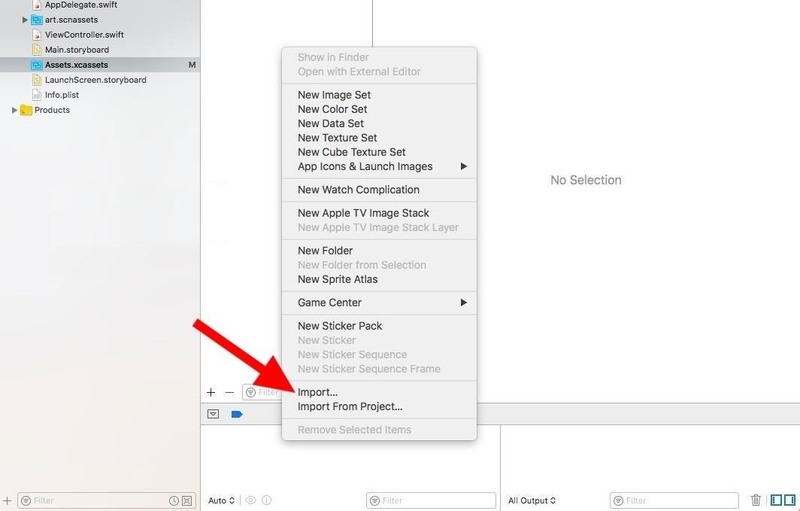 Select "Import" and add the file "overlay_grid.png" from the unzipped folder Assets. 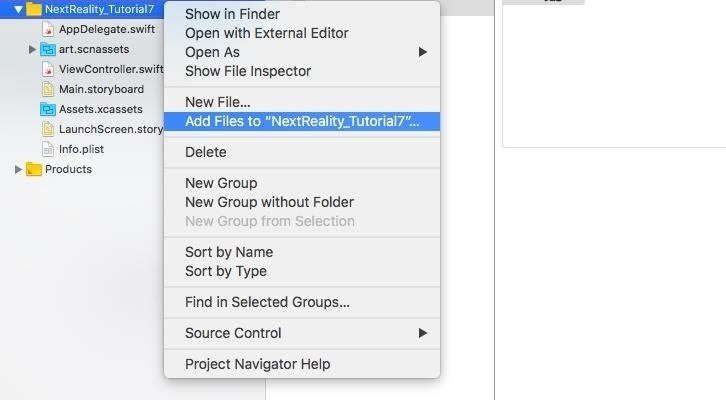 Click again in the project navigator with the right mouse button in the yellow folder for "NextReality_Tutorial7" (or whatever you named your project). Select the option "Add files to & # 39; NextReality_Tutorial7 & nbsp;". 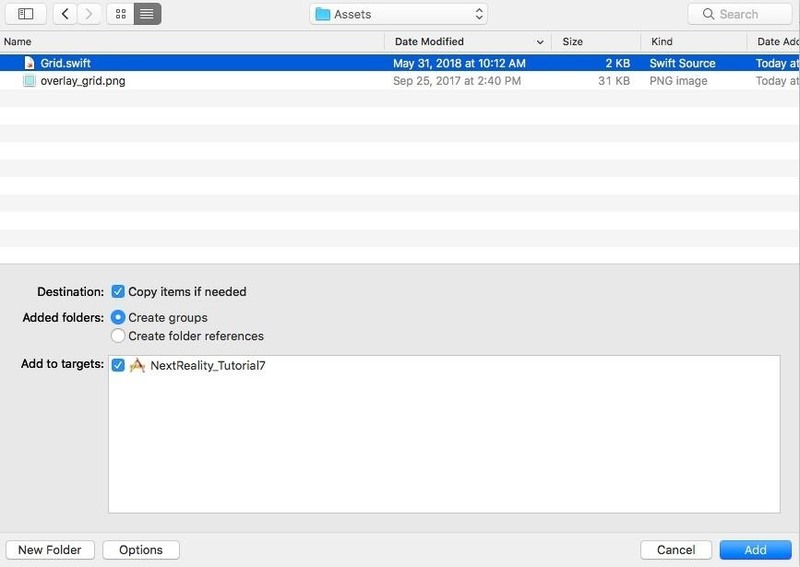 Navigate to the unzipped "Assets" folder and select the "Grid.swift" file. Be sure to enable "Copy items on demand" and leave everything else as it is. Then click on "Add". This file helps rendering a grid for each vertical layer that is detected by ARKit. To quickly discuss ARKit's ability to detect levels, take a look at our tutorial on detecting horizontal levels . Although this covers the coverage of the horizontal plane, the vertical plane detection strategies and logic are quite similar. Copy the following two methods below and insert it at the end of the file before the last curly bracket (} ) file. Using these methods, we can add our grid to the vertical planes recognized by ARKit as a visual indicator. Let's quickly discuss what happens with these two methods:  The didAdd () is called when a new node is added to the ARSCNView . Here we make sure that the recognized ARPlaneAnchor corresponds to a vertical plane and add it as our Grid object, which adds the raster image we imported to each detected plane , ] didUpdate () is called whenever newer ARPlaneAnchor nodes are detected (again, we make sure that they correspond to vertical planes) or when the plane is expanded. In the latter case, we also want to bring our network up to date and expand. We do this by calling update () to this special grid . This part is very important! This ensures that ARKit can detect vertical planes in the real world. The feature points allow us to see all the 3D points that ARKit can recognize. Now launch your app on your smartphone and walk around. Focus on a well-lit wall or flat vertical surface. You should be able to see blue grids whenever a vertical plane is detected, similar to the one below. Checkpoint : Your The entire project at the end of this step should look like the last step 4 code on my GitHub. Now we use the "extent" property of the detected planes to capture its dimensions and print them using SceneKit. All code changes listed below are made in the Grid.swift file. Be sure to open it and follow the steps below. If you go through these steps, you can follow the finished version . Here we extend the functionality of ARPlaneAnchor . By default, the size is returned in meters. Therefore, we will create two properties: "width" and "length", which converts the meters to inches. We also use the "extent" property of the ARPlaneAnchor and get its "x" and "z" values. The extra code added to the setup () method enables 3D text that displays the dimensions of the layer at the top of the grid. Now let's run what we have set up here. With the class SCNText we have created a geometry for the text. We then set the text as the width and height of the aircraft, calculated using our custom extension. We have updated a new SCNNode using the SCNText geometry created from the above step to match its position and scope. We've also made sure we rotate the text node in the same direction that the grid is updated by changing its transform property. This allows us to show the size of the layer at the first construction. We should also update the size of the aircraft as it gets bigger and bigger. Let's do that in the next code changes. This ensures that the dimensions of the layer are dynamically changed as the layer expands. Well done! Assuming you have followed the instructions correctly, you can now successfully detect walls or other vertical flat surfaces with ARKit 1.5! Before discovering the vertical plane, it was very difficult – almost impossible – to spot vertical planes accurately. It's amazing to see how ARKit enabled us to do this without any additional hardware.